The Old Vestry Offices in Enfield, a small polygonal building built in 1829 originally housed the local beadle – responsible for local enforcement of the Poor Law – and then, until the 1930s, a police station. Ealing had a local board of health from 1863 and didn’t become an urban district until 1894 under the Local Government Act of that year. Ealing Town Hall, a grand neo-Gothic building, designed by Charles Jones and opened in 1888 replaced a smaller town hall (still standing, now a bank on The Mall) built just fourteen years earlier but now deemed too small for purpose. 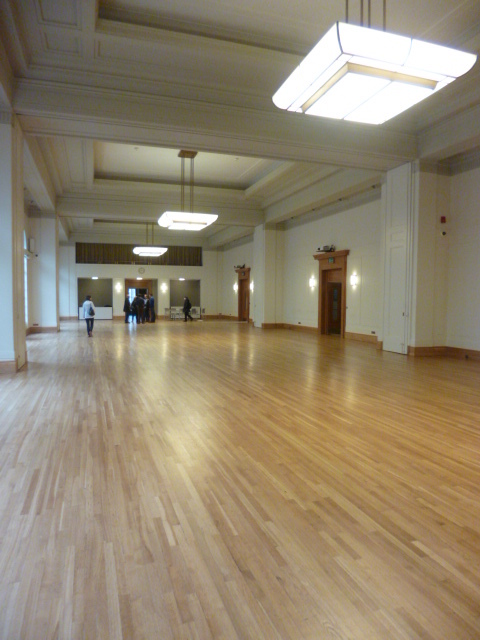 The newer town hall was itself extended in the 1930s and includes an impressive double-height council chamber. Richmond, a municipal borough founded in 1890 in the County of Surrey, was a more conservative body although it can boast (since its incorporation in Greater London in 1965) the first council housing built in the capital. Richmond Old Town Hall, also designed in Elizabethan Renaissance style by WJ Ancell, was opened in 1893 and now houses (since the creation of the London Borough of Richmond) a museum, gallery and local studies archives amongst other things. The first ‘free Classical’ phase of Redbridge Town Hall, by architect Ben Woollard, was opened in 1901 for Ilford Urban District Council. A new central library was built in the 1927 extension for the newly created Municipal Borough and further office space in the 1933 extension, contributing to the eclectic Renaissance of the overall ensemble. Since 1965 it’s served as the headquarters of the London Borough of Redbridge. The Council Chamber is one of the finest in London. A visit to the Tottenham Green Conservation Area gives you an opportunity view a whole slew of historically significant buildings. With my municipal hat on, I’ll draw your attention to Tottenham Town Hall (HQ of Tottenham Urban District Council from 1904 to 1965) and the other examples of local government endeavour and service adjacent – the public baths next door (now just the façade remaining but, as the Bernie Grants Art Centre supported by Haringey Council, still serving a progressive purpose), the fire station (now an enterprise centre), and technical college (built by Middlesex County Council). Passing the new Marcus Garvie Library, you’ll come across Tottenham’s former public library built in 1896 just up the road. It’s as fine an ensemble of civic purpose and social betterment as you could find in the country. And without doubt, Woolwich Town Hall, an elaborate Baroque design by Alfred Brumwell Thomas, is one of the most impressive town halls in the capital. Queen Victoria presides over the main stairway of the building’s staggeringly impressive central lobby but the building was opened, following Labour’s capture of the Metropolitan Borough Council in 1903 by local MP and dockers’ leader Will Crooks. That take-over by one of the largest and most active Labour organisations in the country (don’t neglect the Royal Arsenal Cooperative Society here) heralded a proud era of reform to raise the health and living standards of the local working class. Kingston Town Hall, built ten years later for the then Municipal Borough of Kingston-on Thames and designed by Maurice Webb, displays another of the more traditional forms still favoured in the era – redbrick, neo-Georgian. The Magistrates Courts, incorporated into the building, are now the offices of the Borough’s History Centre. 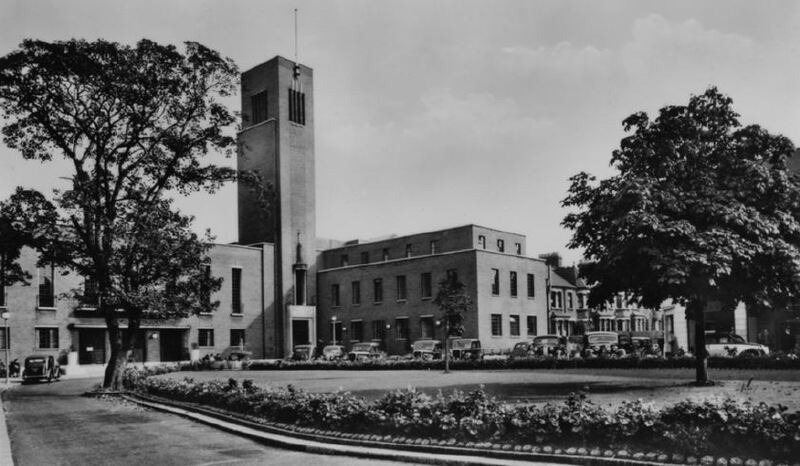 Opened one year earlier, Romford Town Hall (now serving the London Borough of Havering) is a less elaborate building, designed by Herbert R Collins and Antoine Englebert O Geens in an architectural competition stressing the need for strict economy. But it’s an important representative of the International Moderne style increasingly in vogue at this time. Though its steel-framed construction is hidden here by brickwork and stone, rather than the white cement often favoured, this was a consciously forward-looking, more democratic architecture shedding the detritus of the past. The former Dagenham Town Hall (now the Coventry University London Campus) was designed by E Berry Webber in 1937 for what was then Dagenham Urban District Council, undergoing massive growth as a result of the LCC’s nearby Becontree Estate. It’s a modernist design of steel-framed construction – a quintessential civic building of the era. The full height, marbled ceremonial stairway in the building’s main hall is on of the most impressive in the capital. The consummation of this ambitious era of municipal construction is found in Walthamstow Town Hall (now belonging to the Borough of Waltham Forest) and the adjacent Assembly Hall – a magnificent civic complex fronted by sweeping lawns and a grand central pool and fountain. Both the Town Hall, not open this year, and Assembly Hall were designed by Phillip Hepworth in a stripped down classical style with Art Deco touches owing something to Scandinavian contemporaries. The front of the Hall, famed for its acoustics and a favourite recording venue, is inscribed with the words of local son William Morris (which also provide the Borough motto), “Fellowship is Life; Lack of Fellowship is Death’. 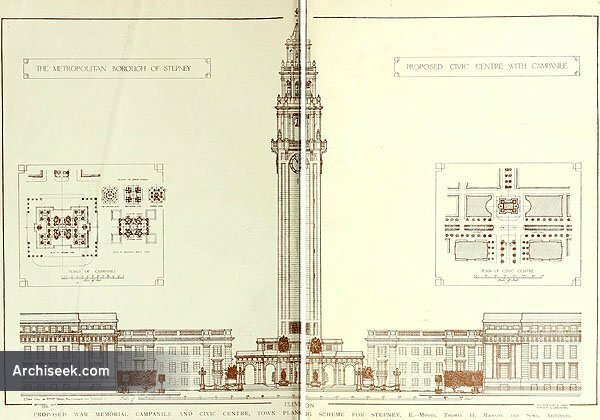 This bonus post – the final post relating to Open House London on the 18-19 September – offers a whistle-stop tour of some of the other municipal buildings featured, some grand, some more humble. We’ll begin with municipal seats of government: in chronological order, the town halls which manifested the civic pride of local government in its heyday. It’s appropriate then to begin with the oldest and one of the most impressive of these, the City of London Guildhall and its present Grand Hall, begun in 1411 – the third largest surviving medieval hall in the country. Externally, it’s probably the 1788 grand entrance by George Dance the Younger in – with apologies to contemporary sensibilities – what’s been called Hindoostani Gothic that is most eye-catching. 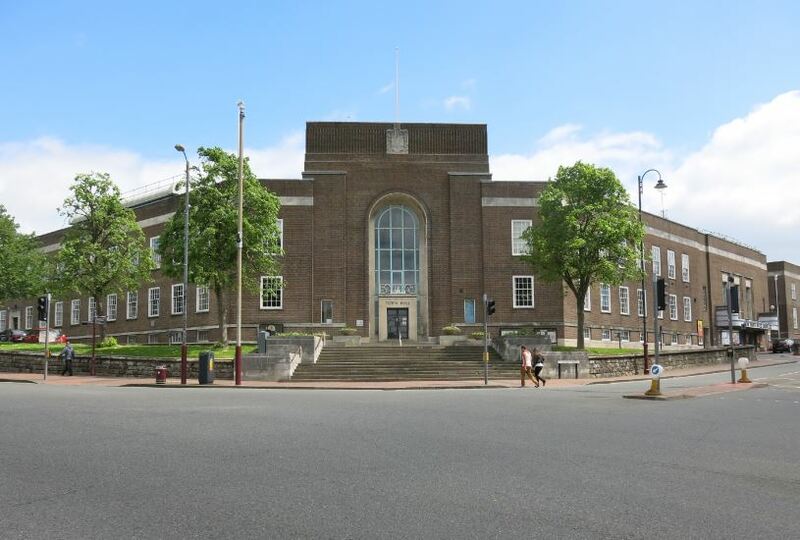 The adjacent Guildhall Library and Art Gallery are also open to view – great facilities along with others provided by the City but as the Corporation is hardly a triumph of democracy we’ll move on. Shoreditch Town Hall, on the other hand, almost matches the Guildhall in its civic pretensions – chutzpah indeed for a building, designed by the impressively named Caesar Augustus Long and opened in 1866 as the headquarters of a mere vestry, the modest form of local government which preceded the Metropolitan Boroughs established in the capital in 1900. 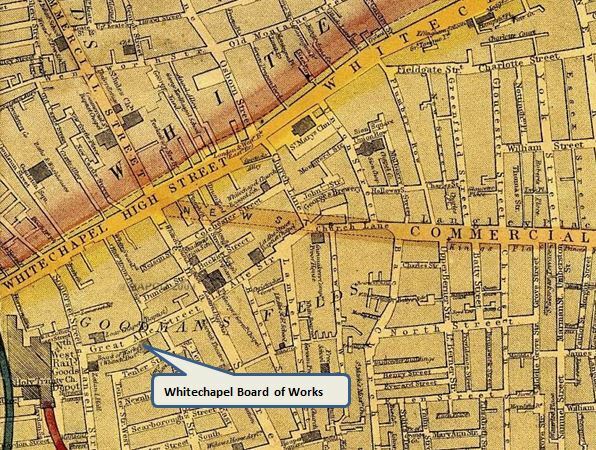 Shoreditch, however, was far from modest – it was one of the most ambitious and innovative such bodies in London, taking particular pride in its path-breaking municipal electricity undertaking. The Vestry and later Borough’s motto ‘More Light, More Power’ had more than metaphorical meaning. You might recognise the figure of ‘Progress’ enshrined in the Town Hall tower too. After a long period of decline the Town Hall was reopened in 2005 and is now a thriving community venue operated by the Shoreditch Town Hall Trust. Look out for a full programme of events celebrating the building’s 150th anniversary later this year. 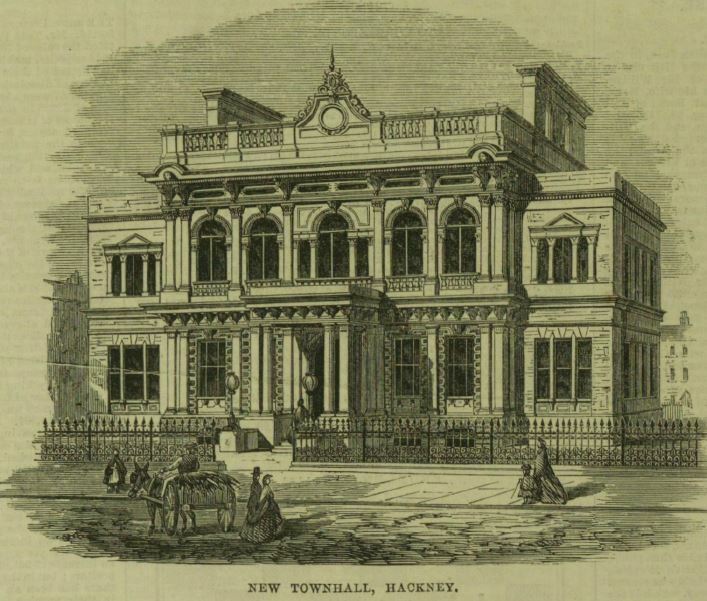 Limehouse Town Hall, opened in 1881, is a humbler building despite the Italian palazzo styling adopted by local architects Arthur and Christopher Harston. It also started life as a Vestry Hall but one intended nevertheless as ‘a structure that…shall do honour to the parish of Limehouse’. 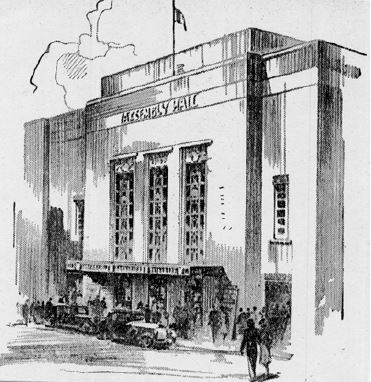 It went on to serve as offices for Stepney Metropolitan Borough Council – while its great hall hosted balls and concerts and even early ‘cinematograph’ shows. It was well known to Clement Attlee, mayor of Stepney in 1919 and later the district’s MP. 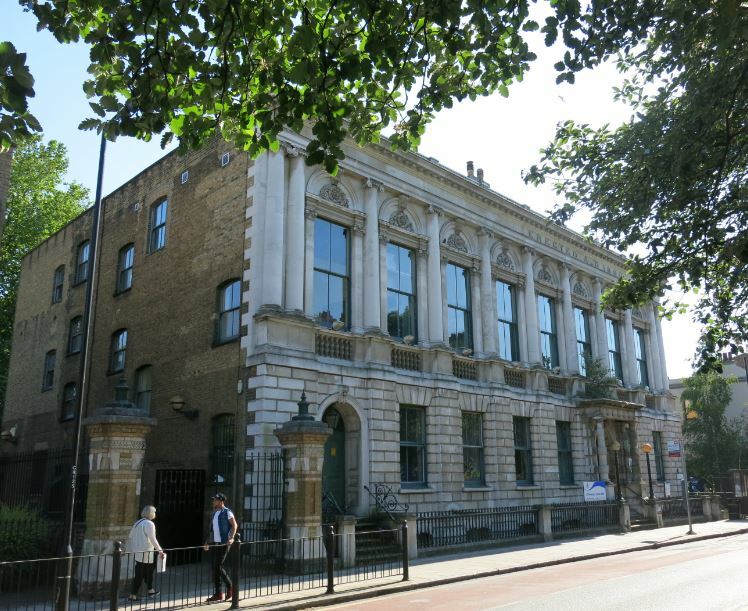 It’s been run by the Limehouse Town Hall Consortium Trust as a community venue since 2004. Finsbury Town Hall was opened in 1895, another Vestry Hall at that time, designed by C Evans Vaughan in ‘free Flemish Renaissance’ style according to Pevsner. Look out for the Art Nouveau entrance canopy and internal fittings too. It’s a beautiful building making good use of a tricky site, subsequently home to one of the most radical of London’s Metropolitan Borough Councils. If you visit, take time to look at Lubetkin’s Finsbury Health Centre five minutes to the south and the Spa Green Estate just to the north though neither feature in the Open House programme. The headquarters of the Metropolitan Water Board, opened in 1920 just across the road, do, however. 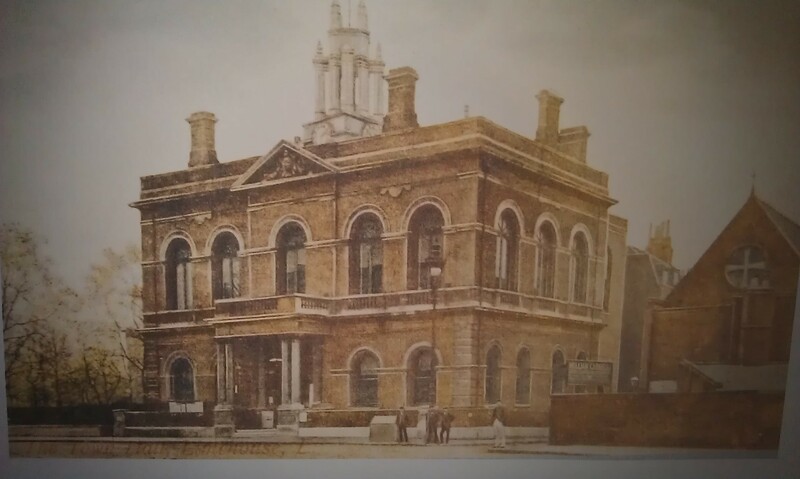 Croydon, created a County Borough within Surrey in 1889, didn’t amalgamate with London until 1965 but the Town Hall, to plans by local architect Charles Henman, was opened in 1896 to provide ‘Municipal Offices, Courts, a Police Station, Library and many other public purposes’. The Croydon Town Hall and Clocktower complex retains some local government functions – the Mayor’s Parlour and committee rooms – but also offers a museum, gallery, library and cinema. Another fine example of Baroque revival is Deptford Town Hall, designed by the noted team HV Lanchester, JA Steward and EA Rickards and completed in 1907. 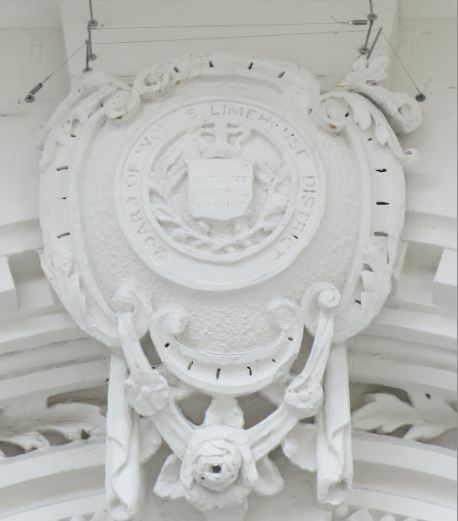 Its exterior sculptures capture local pride in the area’s naval heritage. The guided tours focus on more controversial times – the Town Hall’s role as a court for trying conscientious objectors during the First World War. The interwar era featured a new wave and new style of municipal architecture. Probably the most notable example, Hornsey Town Hall in Crouch End, doesn’t feature in Open House this year but, now a local arts centre, can be viewed at other times. Opened one year later in 1936, Romford Town Hall (now serving the London Borough of Havering) is a less elaborate building, designed by Herbert R Collins and Antoine Englebert O Geens in an architectural competition stressing the need for strict economy. It remains, however, a very fine example of the new International Moderne style in vogue at the time. Though its steel-framed construction is hidden here by brickwork and stone, rather than the white cement often favoured, this was a consciously forward-looking, more democratic architecture shedding the detritus of the past. 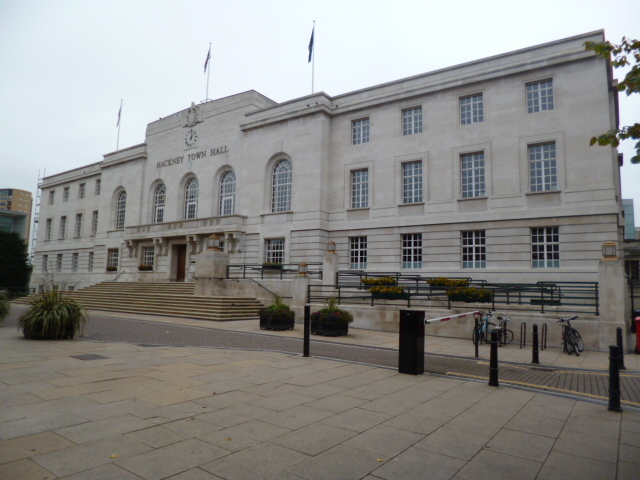 Walthamstow Town Hall (now belonging to the Borough of Waltham Forest) probably has the best setting of any town hall in London – a grand civic complex fronted by sweeping lawns and a grand central pool and fountain. 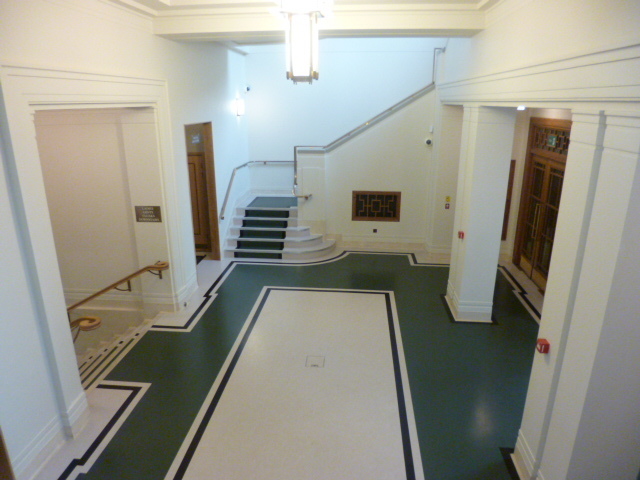 The Town Hall itself was commissioned by the new Borough of Walthamstow created in 1929 and designed by Phillip Hepworth in a stripped down classical style with Art Deco touches owing something to Scandinavian contemporaries. Begun in 1937 and completed in wartime, these straitened circumstances led to some economising in fixtures and fittings but it remains an impressive building. 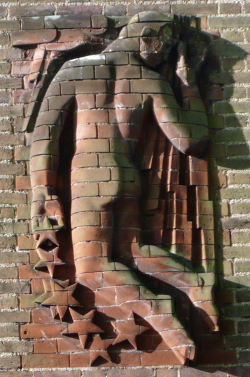 Walk round the back to see five figures by Irish sculptor John Francis Kavanagh, inspired by local hero William Morris, and note the Borough Coat of Arms mosaic at the entrance (and elsewhere) with its motto taken Morris – ‘Fellowship is Life’. You’ll see this inscribed on the pediment of the Assembly Hall, contemporaneous, to the right. The Magistrates’ Courts to the left weren’t built until the 1970s. All these buildings, in different ways, reflect perhaps the proudest and most progressive era of local government – seen most practically in the health centres, washhouses and baths and housing which I’ve written of elsewhere but manifested too in administrative headquarters intended to represent and mobilise a civic patriotism. Some of that shine had rubbed off by the 1970s – an era of civic centres in which function outweighed form in terms of design. Harrow Civic Centre, despite a distinguished architectural pedigree – it was designed by Eric Broughton, the winner of an architectural competition judged by a panel including Sir Basil Spence and Sir Hugh Casson – is no exception in this respect. Opened in 1973, it’s essentially a Brutalist, checkerboarded concrete box built around a large central courtyard. 45 years ago, Harrow Council built this Civic Centre because local government was growing and workers needed a building to match. Today, with the cuts faced by every Council, local government is changing all around the country. It’s proposed to relocate, in his words, ‘a smaller and more agile organisation’, in three new centres. Presentations on the regeneration scheme will be presented in the Council Chamber during Open House. All that could stand as an epitaph for local government but the new Brent Civic Centre, opened in 2013 near Wembley Stadium lets us end on a positive note. Brent chose a different path; the centre unites Brent’s civic, public and administrative functions under a single roof – in the words of its designers Hopkins Architects, ‘a new hub and heart for the community where residents can meet, shop and eat’. The latter, of course, is another reflection of changed times and priorities and an ethos in which public service is at best complemented by commercial imperatives and, at worst, subordinated to them. I could add much, much more. I’m conscious that I’ve not included the many schools which feature in Open House, nor the libraries, old and new. Those endeavours reflect the cultural ambitions and achievements of municipalism but I’ll conclude with a brief mention of examples of more prosaic but vital functions. Two example of Hackney public baths feature, firstly the small but beautifully formed bath and washhouse on Shacklewell Road now the Bath House Children’s Community Centre, designed by Borough Architect Percival Holt in what’s described as Modernist Classical style, opened in 1931. It’s been converted as the name implies. Four years later, Holt designed a grander Art Deco scheme in Hackney Wick. The former Gainsborough Road Baths are now the Cre8 Centre, a busy cultural and event space. These provided slipper baths and laundries. Finsbury was again more ambitious. 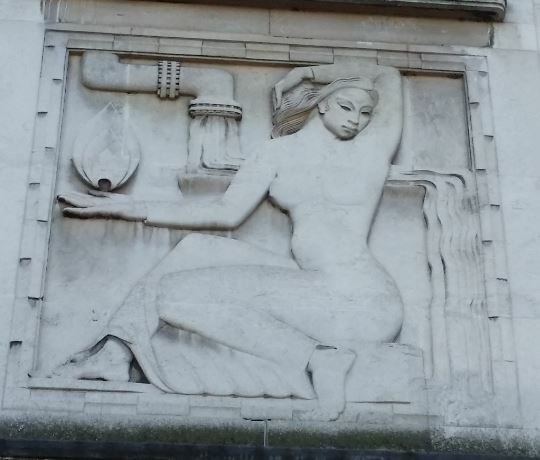 The Ironmonger Row Baths, designed by specialist architect AW Cross and opened in 1931, included those, two pools and then – unheard of luxury for working men and women – Turkish baths. The Council believed ‘facilities for healthy recreation and personal cleanliness…essential for the health and well-being of our people’. The words speak to the best of service to community which local government has embodied. London’s boroughs celebrate their 50th anniversary this year; of these, Tower Hamlets has had a more colourful history than most. Now the borough has a directly elected executive mayor and local governance might – on the face of it – seem relatively simple. You probably know better than that but this post looks to the past – at the complexity of some of the borough’s earlier forms of local government and, specifically, those in Stepney, one of the three metropolitan boroughs which combined to form Tower Hamlets in 1965. London’s first city-wide administration was created in 1855 in the Metropolitan Board of Works. This was initially a body of 45 members, elected indirectly by 43 London districts: the Vestry in 29 of the larger parishes and 12 District Boards of Works in which smaller parishes were combined (plus special bodies in the City and Woolwich if you’re counting). Local administration before 1900: the Metropolitan Borough of Stepney was formed from the Whitechapel and Limehouse Districts and the vestries of St George-in-the-East and Mile End Old Town. 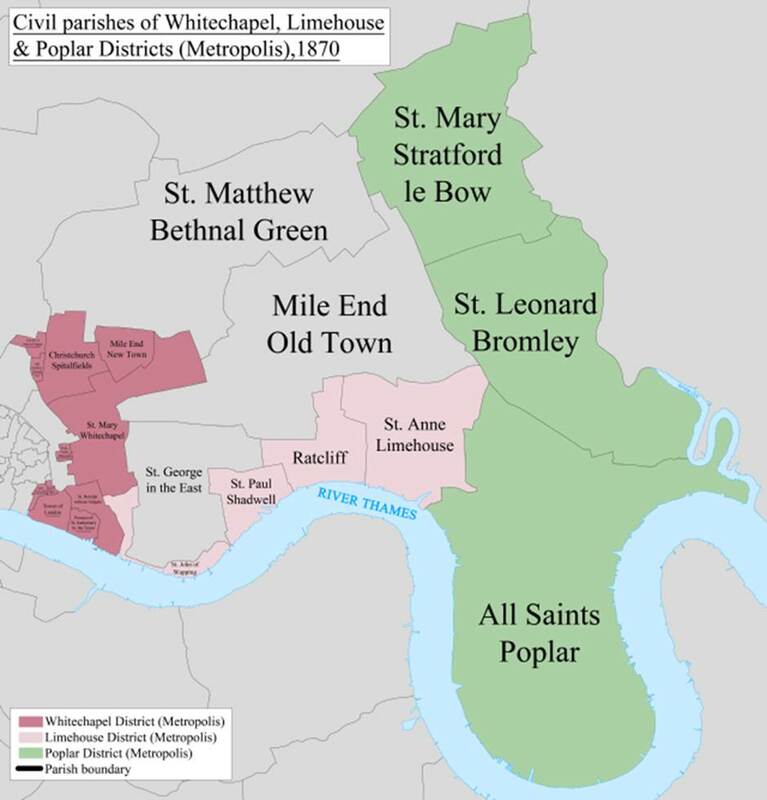 In what became the Metropolitan Borough of Stepney, formed in 1900, there were two Vestries governing in their own right and two District Boards, the latter comprising a total of 13 parishes. Keeping up? I haven’t even mentioned the local Boards of Guardians which had administered the Poor Law since 1835. These local bodies were generally notable, according to critics, for their ‘apathy, indifference or jobbery’. (1) All male householders (and unmarried female ratepayers from 1869) could vote but only those who paid £25 in rates could stand – a recipe for an unrepresentative body of middle-class members whose main concern was to keep down their local taxes. The Whitechapel District Board confronted, to be fair, huge problems with few resources. Faced by criticism from the Sanitary Committee of the Jewish Board of Guardians in 1884, the Board complained that its difficulties in enforcing sanitary regulations were ‘greatly intensified by the arrival in the district of a vast number of foreign Jews’ and its inspectors fully occupied in trying to remedy ‘the filthy conditions of the rooms, yards and water closets occupied…by these people’. 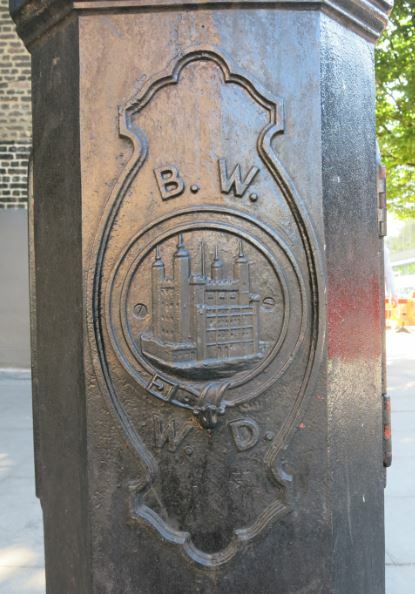 There’s no remnant of the Whitechapel Board’s former offices in Alie Street, Aldgate, but it has left at least one physical reminder of its more progressive ambitions – an electric lamp-post standing outside the Whitechapel Bell Foundry on Whitechapel Road which proudly bears the Board’s arms. 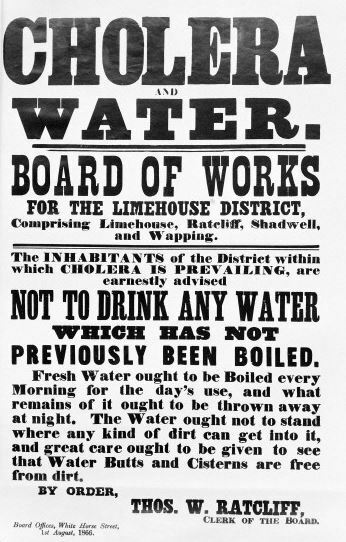 Within four years the Board was grappling with one of the latest and largest of the cholera outbreaks to afflict London in this period – its sound advice to locals to avoid drinking potentially unsafe water availing little against the terrible sanitary conditions of the area (which couldn’t be blamed on immigrants this time). Appropriately, after 1900 the building would house the Borough of Stepney’s Public Health Department. 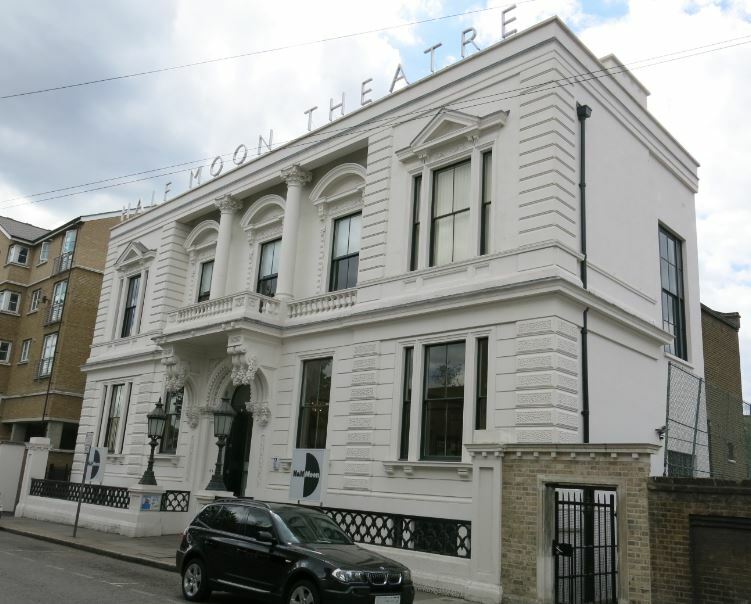 In 1994, it became the home of the Half Moon Theatre, committed to giving ‘young people an opportunity to experience the best in young people’s theatre’. To the north, the Mile End Old Town parish (not to be confused with Mile End New Town which formed a subordinate part of the Whitechapel District) was an independent vestry and it marked its status by the erection of a vestry hall on Bancroft Road in 1862 for a comparatively modest £3700. To the right of the large entrance hall, and at the heart of the vestry’s functions, lay the offices of the surveyor, medical officer and inspector of nuisances. On the left was a committee room and – showing the peculiar mix of roles which remained – a churchwarden’s room. 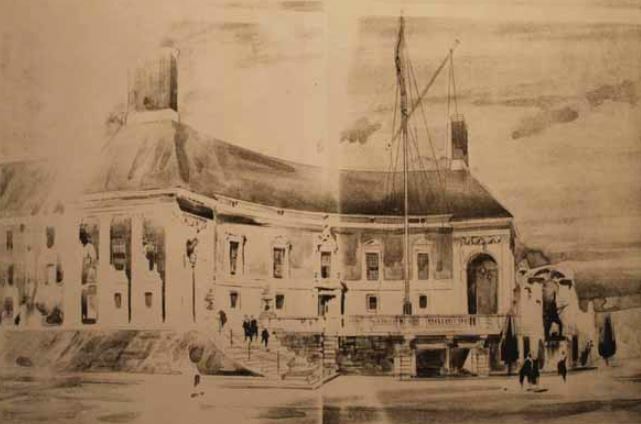 All were, according to the contemporary newspaper report, ‘lofty and well lighted’ but the showpiece of the building lay, up a Portland stone staircase, on the first floor – the vestry hall itself, 56ft wide, 36ft long and 22ft high with a striking elliptical ceiling and cornice decorated with the arms and seals of the Vestry and the local Board of Guardians. 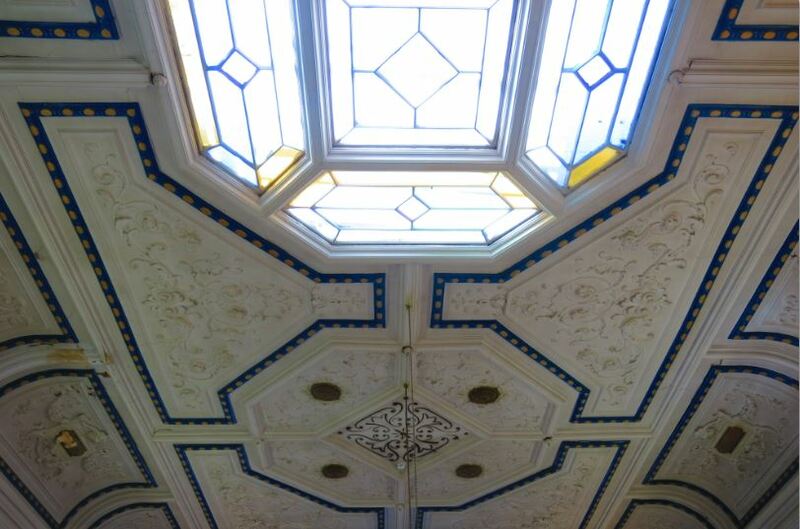 Two sun-lights in the ceiling, each containing 72 gas lights, provided light and an early form of ventilation. 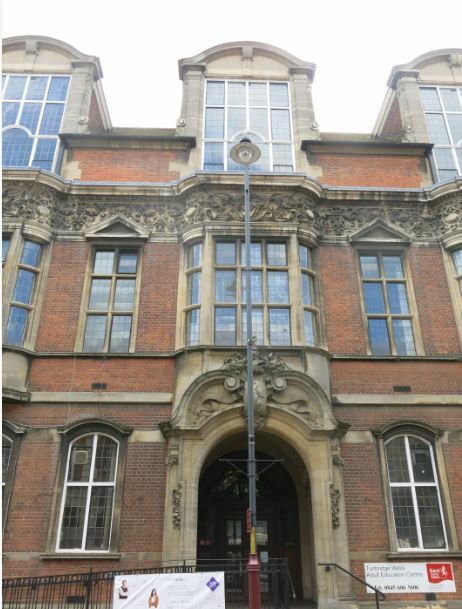 The building, its vestry functions superseded in 1900, was converted two years later – with the aid of Carnegie funds – to a library: the lending library situated in the former vestry hall and a reference library in an extension to the rear built in 1905 designed by MW Jameson, the Borough Engineer. The latter is praised by Pevsner who describes it as an ‘unexpectedly lavish…large room with Composite pillars and lush Renaissance style ceiling’. 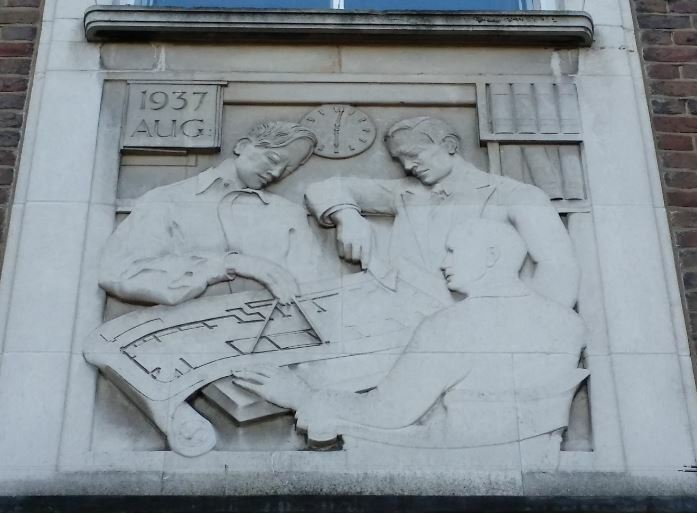 A children’s library was added in 1937 in a six-bay extension to the left of the main façade designed by a later Borough Engineer, BJ Belsher. 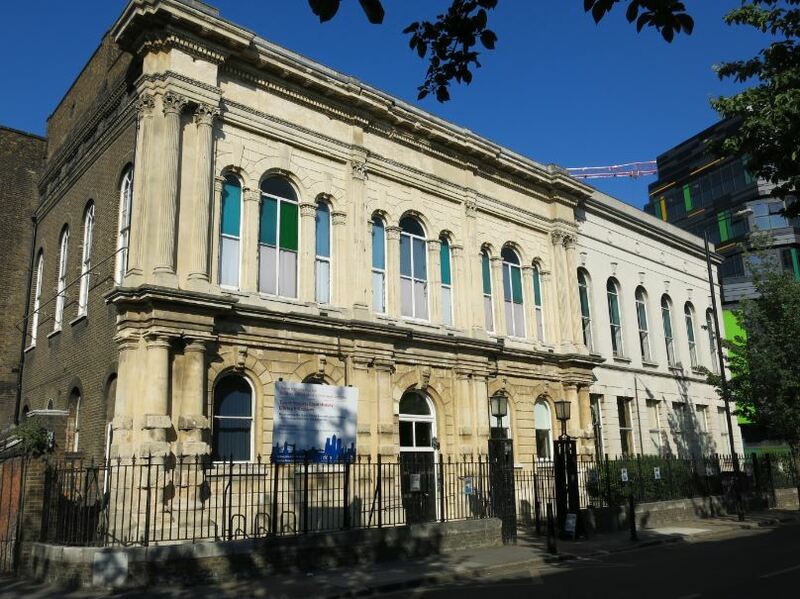 The building now houses the excellent Local History Library and Archives – always worth a visit and, if you get there before 6 August 2015, you’ll be able to see a fascinating exhibition on the history of Tower Hamlets. You might expect Limehouse Town Hall, standing on Commercial Road, to have been the main centre of local government in earlier days but it was in its inception merely the home of the Limehouse Vestry. It was designed, also ‘in Italian style’, by local architects Arthur and Christopher Harston. in an important parish like Limehouse should be not merely a place where the Vestrymen were to meet and discuss parochial matters, but a fine commodious building where the parishioners could meet and discuss imperial and local politics. While in the provinces, he had noticed some imposing buildings of the kind erected, especially in the northern counties, where he was happy to say the parishioners did not mind contributing in the shape of the rates in order that they might get a place where they might state their grievances or get educational enjoyment after their labours. It’s a reminder of a time when the ‘Northern Powerhouse’ was less a political tactic than a reality on the ground – one, in fact, which could make London appear a little ‘provincial’. In the end, the building probably entered local affections more through its grand main hall’s role as a venue for dances, entertainments and some very lively political meetings. Limehouse Town Hall would enjoy a long afterlife after 1900 – housing Stepney Borough Council’s committee rooms, then an infant welfare centre…and much more besides. 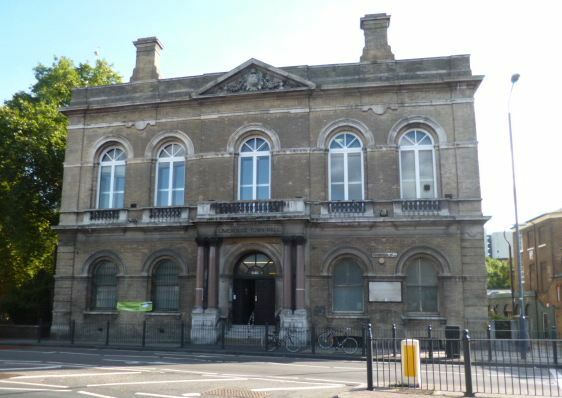 It currently houses the Limehouse Town Hall Consortium Trust, working hard to create an arts and community centre for the district. I’ve written more on its colourful history in this post. Finally, there’s the St George-in-the-East Vestry Hall in Cable Street opened in 1860. Its cost – a little under £4700 – had aroused, according to a contemporary press report, ‘a strong display of party opposition’ at the laying of its foundation stone. For all that, it was, in the first place, a fairly modest edifice: a five-bay building designed by Andrew Wilson whose ‘general feeling’ was described, yet again, as Italian – ‘this style being followed throughout the building, in the internal as well as the external decorations’. 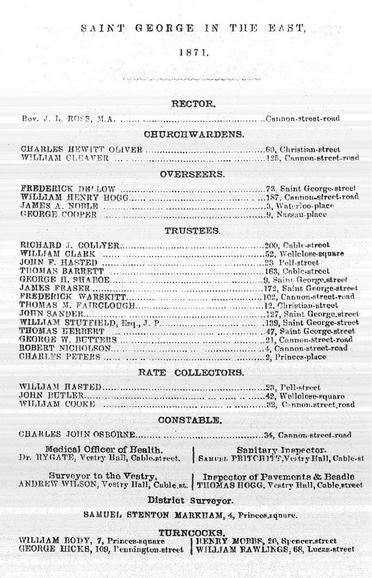 The Vestry report from 1871 gives a good insight of its work: turncocks responsible for opening the street pumps which supplied water for many local people and an inspector of pavements whose subsidiary and ceremonial role as beadle reminds us of the sometime self-regard of these early officials, so mercilessly satirised by Dickens. An 1899 extension to the vestry hall costing almost £8000 significantly enlarged the building though, as it simply lengthened the existing façade, almost indistinguishably in terms of architectural style. It added a coroner’s court and a new main hall accommodating 550. In Stepney (unlike the neighbouring boroughs of Bethnal Green and Poplar), this was never brought to fruition. There were great plans, notably in 1919 for a grand Beaux Arts scheme designed by TH Mawson which proposed to transform Cable Street into a stately boulevard, renamed fancifully ‘Stepney Greeting’ and intended to open up the Borough to its more affluent western neighbours. (7) The formality of the scheme and its overpowering campanile perhaps make us grateful it wasn’t fulfilled. The scheme was revived more modestly and more functionally in plans for a seven-storey building (which included space for the Borough’s Electricity Department) in 1937. It received planning approval from the London County Council but the war intervened and Stepney muddled on until swallowed up by the new Tower Hamlets authority in 1965. Stepney Town Hall also enjoyed a long afterlife – home to a boxing club where the likes of John H Strachey and Terry Marsh trained, neighbourhood housing offices for the new Tower Hamlets council, facilities for the local Somali community, a law centre, and since 2013 the Unite union’s first community centre. 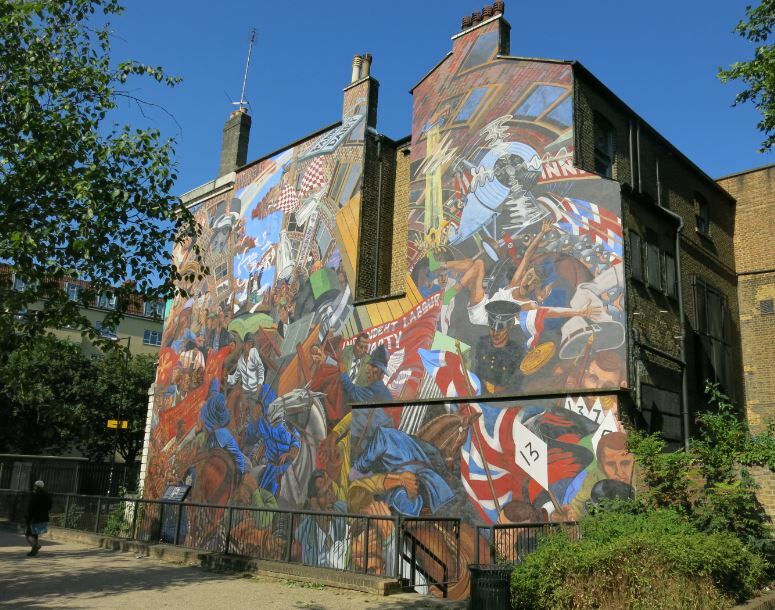 Non-locals are likely to visit it for the striking mural commemorating the 1936 Battle of Cable Street unveiled in 1983. If all this seems parochial (and, literally, it is in some respects), don’t neglect the vital role and incipient revolution marked by these early manifestations of local government and don’t disdain the civic pride signalled by its early structures. And if it was good enough for the greatest of our prime ministers, Clement Attlee – a one-time Stepney councillor and mayor – it should be good enough for us. This post is partly based on a talk I gave for Tower Hamlets Local History Library and Archives in June 2014. Maybe only its biggest fans would claim that the town hall and civic complex at Tunbridge Wells make a truly beautiful ensemble but they do possess a striking dignity and presence. Above all, they tell the story of our civic culture’s rise and fall, from a time when once local government stood proudly at the heart of its community to the present when it seems we must live in thrall to the market and its values. You wouldn’t expect to look to Royal Tunbridge Wells – that descriptor is important to some of its citizens – as a prime exemplar of municipal progress but, in fact, the town is a good example of the growth of local government’s functions and status. The town grew rapidly in the first half of the 19th century and, typically, acquired the trappings of necessary self-government – initially the ‘night-watchman’ duties of policing and rudimentary sanitation – in 1835. By the end of the century, the town’s population was approaching 30,000 and in 1889, these Town Commissioners applied for incorporation as a Municipal Borough. The new councillors were conscious of their civic duties. Public baths (demolished in 1974) were opened on Monson Road in 1898, a Technical School (built by the Council, administered by the County Council) opened four years later. But the town hall – an adapted market hall – was makeshift. Only belatedly, in 1928, did the Council acquire land on Calverley Terrace for new municipal buildings worthy of its role. Although the town’s first scheme (submitted in 1931 and designed by the architect Vincent Harris in fairly standard neo-Georgian style) was scuppered by the Ministry of Health’s refusal of borrowing powers, this was an opportune moment – an era when the expanding functions of local government were justifying a new heyday of civic architecture. In the later 1930s, economic recovery and increased spending allowed Tunbridge Wells – and other authorities – to revisit their building plans. But the Council remained cautious: the architectural competition announced in 1934 stipulated that the entire scheme should cost no more than £120,000 and achieve dignity ‘without elaborate or unnecessary features’. 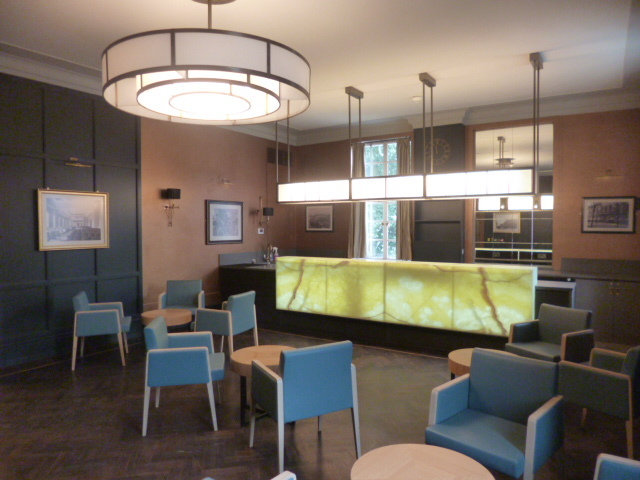 (1) In this, however, the conservative burghers of Tunbridge Wells were in accord – unwittingly perhaps – with the modernist functionalism coming into vogue. The winning entry was submitted by the architectural partnership of Percy Thomas and Ernest Prestwich. 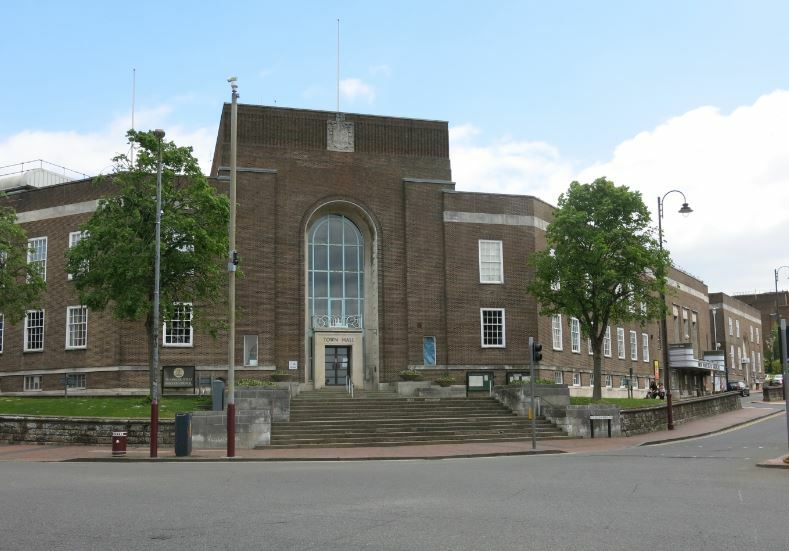 (Thomas would also design the Swansea Guildhall and Swinton and Pendlebury Town Hall – now the Salford Civic Centre.) It conformed to a still prevailing neo-Georgian aesthetic but in a stripped-down form reflecting a contemporary transition to more modernist forms. Compared to the path-breaking schemes of the same period at Hornsey and Poplar, for example, it is, according to Architectural History Practice, ‘a weaker design in an outdated style’ but to municipal dreamers it is impressive, not architecturally perhaps but certainly through the civic ambition it marks. The centrepiece of the complex is, appropriately, the town hall itself, its main entrance occupying a commanding hilltop and corner position, flanked by municipal offices on each side. It was opened, with little fanfare at a time when more pressing matters occupied national attention, in 1941. The overall scheme is faced in brown brick laid in Flemish bond with dressings of Portland stone. The sash windows are traditional Georgian. 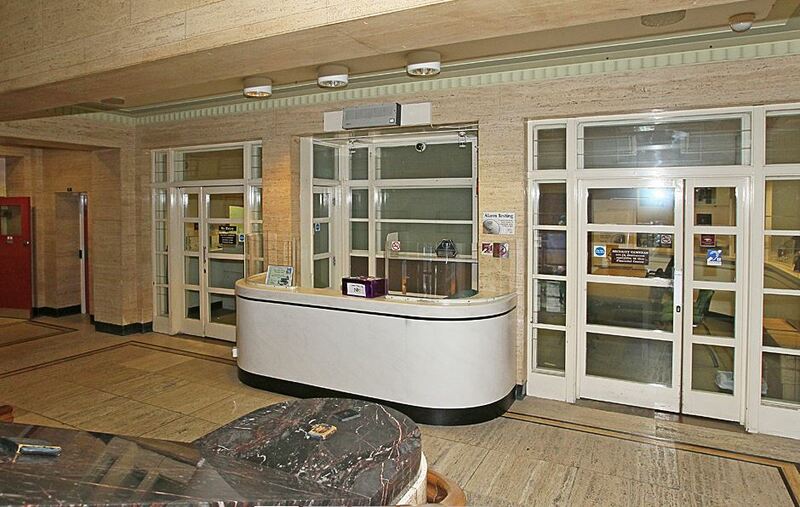 There’s a light-touch Art Deco in some of the external fittings; it can be seen more opulently internally. To the right-hand side, lies the Assembly Hall, the first component opened to the public, in 1939. It’s of similar style but distinguished by three carved stone reliefs representing Dance, Drama and Music – a nod to the gaiety and culture within its portals. Further right lay the police station and courtroom. 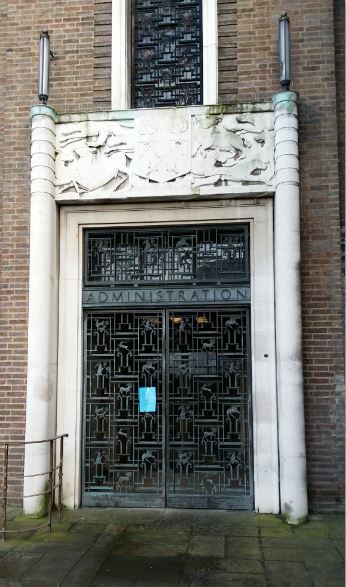 The interior has a number of Art Deco features; the main entrance boasts an impressive carved stone relief above (created – like the Assembly Hall reliefs – by Gilbert Seale and Sons of Camberwell) representing the majesty of the law and the administration of justice and including, in this case very aptly, the town’s motto ‘Do Well Doubt Not’. Back around to the left, fronting Mount Pleasant Road but like the ensemble as a whole located on the newly-created thoroughfare Civic Way, is the Borough’s relocated Library and Museum, its construction halted during the war and not finally opened until 1952. It is, in all, a commanding presence at the very heart of the town – a signifier of the authority and service of the local authority within its community – and one that might deserve respect. The buildings were Grade II listed in 1995. The plan was relatively straight forward. A joint 50/50 partnership it was set up to bring forward civic, retail, commercial, community or residential property opportunities by redeveloping or regenerating assets in the council’s portfolio. The Council claimed that the buildings were no longer fit for purpose – and they did, of course, require modernisation and upgrading – and suggested it might move to a recently vacated office site on the outskirts of town. What was needed in the centre was a revamped shopping precinct. The philosophy that apparently underpins the scheme should be of concern to us all: that shopping and shopping alone is all that is required to make a successful town centre. As libraries, education centres and assembly rooms don’t offer significant commercial value, they should be ‘regenerated’ and replaced by chain stores. I don’t suppose – although I might be doing it an injustice – that the Royal Tunbridge Wells Civic Society is a politically radical body but, in this, it might (and I hope it does) speak for a much broader section of the population disquieted by a current politics which trashes ideals of public service and reduces everything to money and the market. The commercialisation of the NHS, the marketisation of education, the financialisation of housing, the sale of public assets, the privatisation of public functions to an oligopoly of large private contractors…a world, in short, which knows the cost of everything and the value of nothing. But here, it appears – unlikely though it may seem – that the citizens of Tunbridge Wells have begun a successful fight-back. Popular opposition and a palace coup removed an unpopular Tory Council leader in 2010 and a more refined – and more civic option – has emerged. 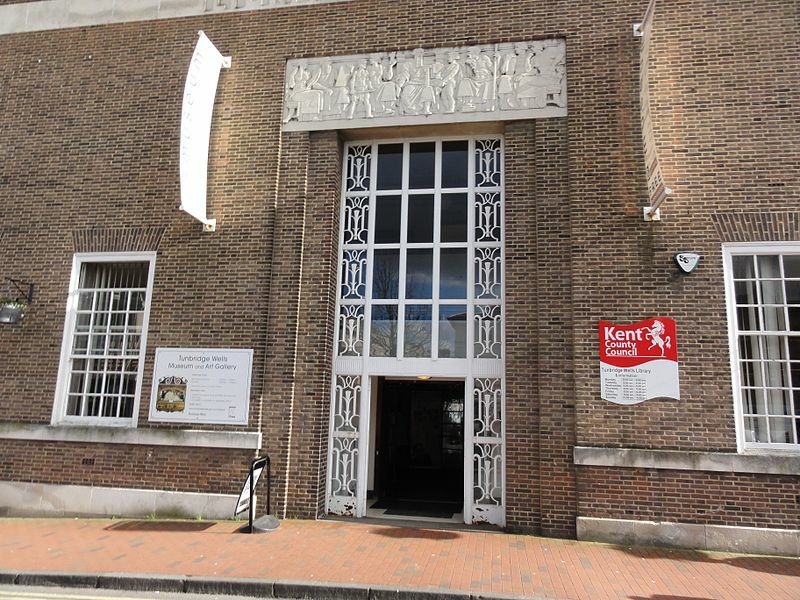 If you visit Tunbridge Wells, you’ll naturally want to see the town’s beautiful Georgian centre in all its historic splendour but do take a walk up the hill to view the town’s proud Civic Complex. It represents a more democratic and progressive history and one which we must ensure does not become ‘merely’ historic. 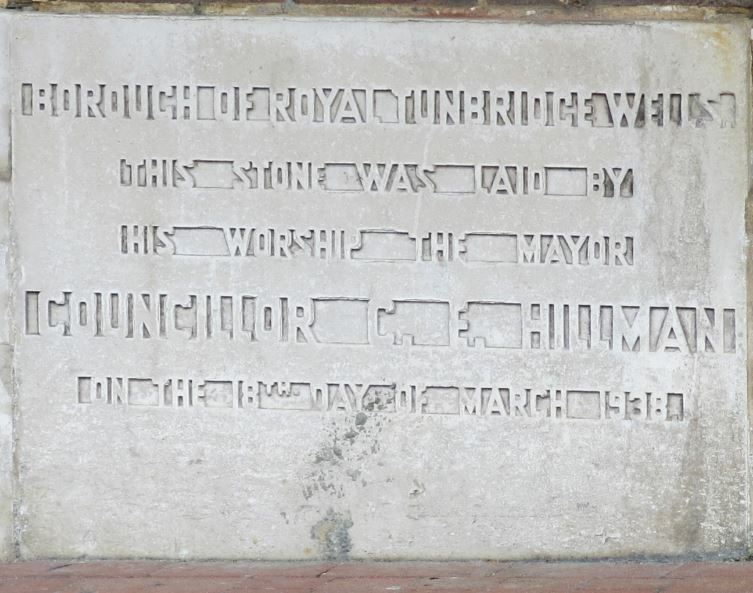 (1) Quoted in Architectural History Practice, ‘Conservation Statement: Tunbridge Wells Civic Complex’ (ND). Most of the historical and descriptive detail of this post is drawn from this source which also contains an excellent overview of the civic architecture of the period. 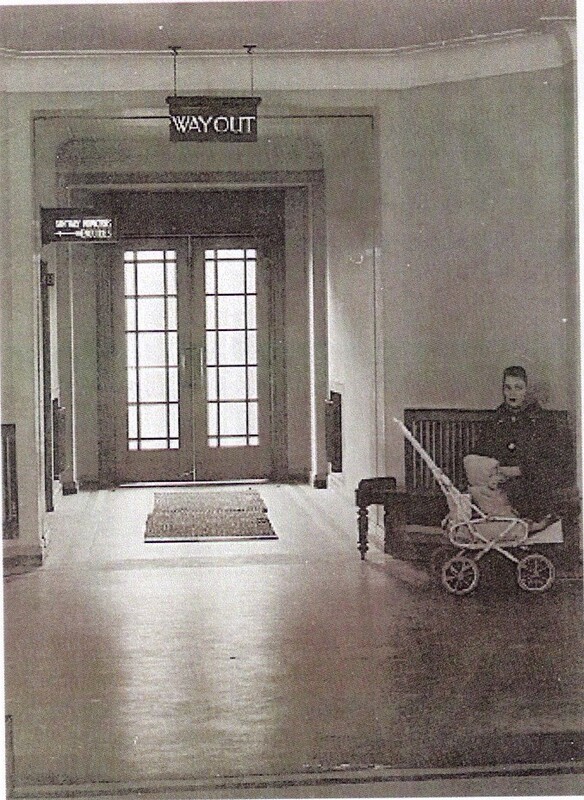 It’s easy to miss the modernist masterpiece of Hornsey Town Hall, completed in 1935, as you fight your way through the yummy mummies and baby buggies of Crouch End but take time to admire it. It’s been described as ‘the quintessential English modern public building of the decade’. (1) And look to the buildings to left and right and through the clutter of contemporary commercialism – this was a civic complex intended to enshrine the role of local government at the very centre of local life. Hornsey’s first local administration had been formed as far back as 1867. The Hornsey Local Board built its offices in Southwood Lane in Highgate the following year. At that time, Hornsey was basically a collection of local villages but the coming of the railways would radically transform it. With seven local rail stations by 1887, Hornsey became a centre of middle-class villadom – the home of London’s clerks and their daily commute. Hornsey became an Urban District Council under the 1894 Local Government Act and was raised to municipal borough status in 1903. Its bid to become a county borough (an all-purpose authority free of county council jurisdiction) was twice rejected but though the council was dominated by that local incarnation of Conservatism, the Municipal Reform Party, for most of its life, it saw itself as modern and progressive. Some of the first council housing in the country was built by Hornsey UDC and in 1903 it inaugurated its own electricity supply service, building a generating station on Tottenham Lane. A cottage hospital was opened in 1910. By now, the borough’s centre of gravity had shifted to Crouch End and the council needed a home to reflect both this new reality and its civic pride. It purchased a wedge-shaped area of land on the Broadway in Crouch End in 1920 and 1923 and ten years later it announced a design competition to build a town hall on this awkward plot. desirous that the character of the buildings shall be dignified and they rely on good proportions and a fitting architectural setting rather than elaborate decoration and detail, which is not required. Stress is laid on straightforward planning, with rooms and corridors well lighted and ventilated. This would be a town hall, eschewing the municipal baroque or neo-classicism in vogue before the war, in a modern idiom. Notwithstanding these intentions, The Architect and Building News was sniffy about this contest: ‘In all, 218 highly trained brains have exerted themselves to the full to find the solution to the problem which should never have been set’. (2) But, in the end and as further plots on the frontage of the Broadway became available, a civic complex was created that would do the Borough proud. 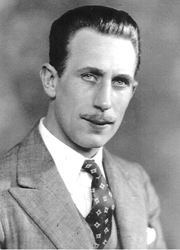 The winner of the competition was Reginald Uren, a 27-year old New Zealander, and, though he went on to build a prestigious career, this would remain in many ways his masterpiece. Uren’s skill lay in separating out and distinguishing between the functional areas and setting the building back to provide as dignified an approach as the site allowed. The public hall to the left-hand side was marked by elongated windows and a grand triple entrance. 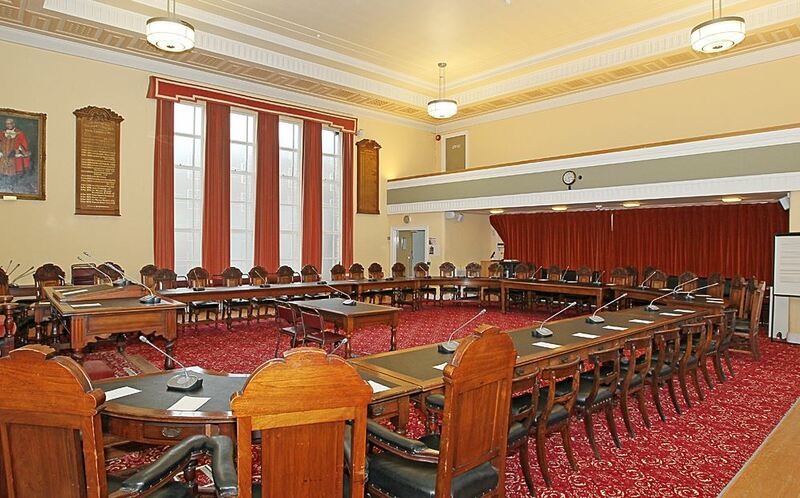 The council offices were given a smaller but impressive ceremonial entrance to the right while the ‘dignified’ aspect of the council’s activities was given full play in the impressive council chamber and mayor’s parlour on the first floor. Gracious and rather slim in its lines, and faced with pinkish-grey bricks of a beautiful colour and texture, Hornsey Town Hall is the sort of building that is come upon with an exclamation of pleasure…That the building has both Dutch and Swedish flavours is true, but they are digested to the local scene. 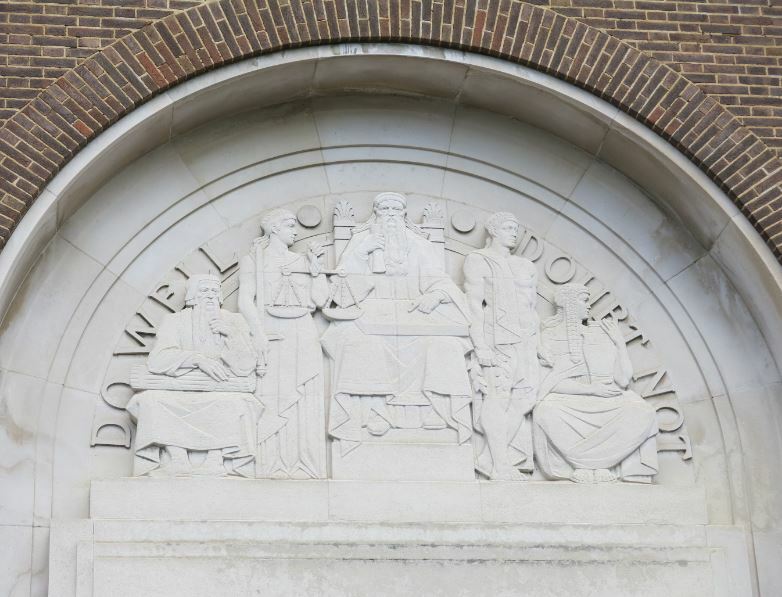 The Times article celebrates the Royal Institute of British Architects bronze medal awarded in 1936, recognising the building as the best erected in London during the previous three years. And those Dutch and Swedish influences which it identifies refer to two of the outstanding civic buildings of the era – Dudok’s Hilversum Town Hall (completed in 1931) and Stockholm Town Hall (completed in 1923) – which provided some of Uren’s inspiration. 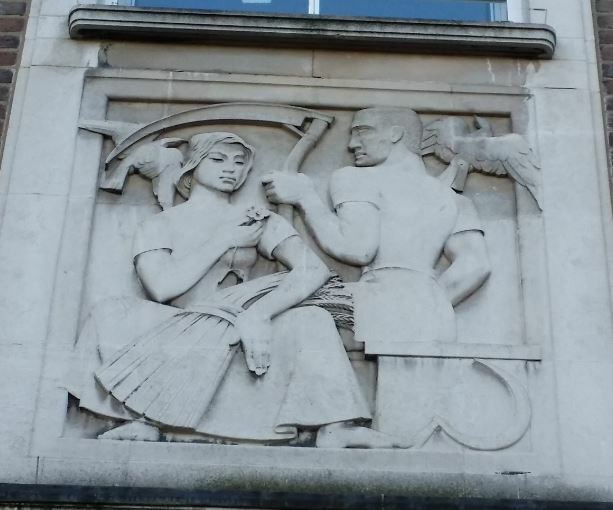 (4) In fact, Uren employed decorative elements – notably a stone relief lintel, sculpted by Arthur Ayres, and an elaborate bronze grille at the right-hand entrance – to soften the rather stark lines of Dudok’s prototype. Within a couple of years, the Council was also able to provide the Town Hall with a more complimentary setting. 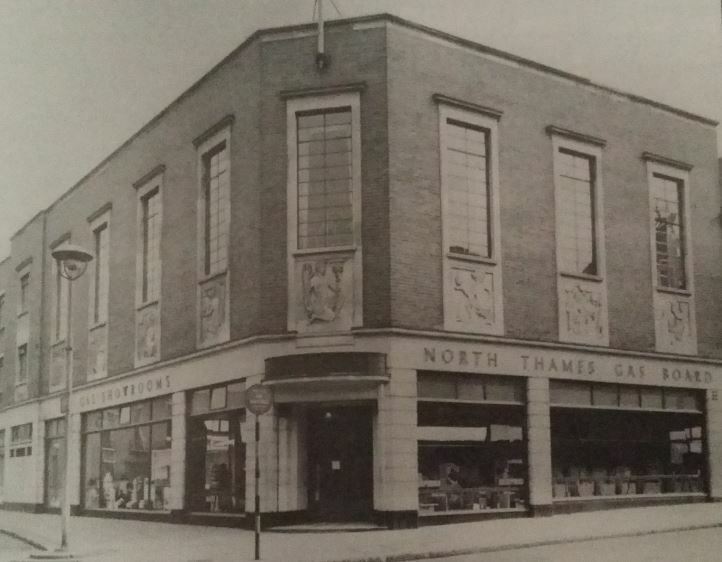 The architectural firm, Dawe and Carter, designed a new showroom and offices for the Hornsey Gas Company – a private undertaking until nationalised in 1947 – to the right of the Town Hall in a style which paid conscious tribute to Uren’s building and was similarly graced by Ayres’ sculptures. And Uren himself was able in 1938 to adapt a former telephone exchange to the left into showrooms for Hornsey’s municipal electricity department. 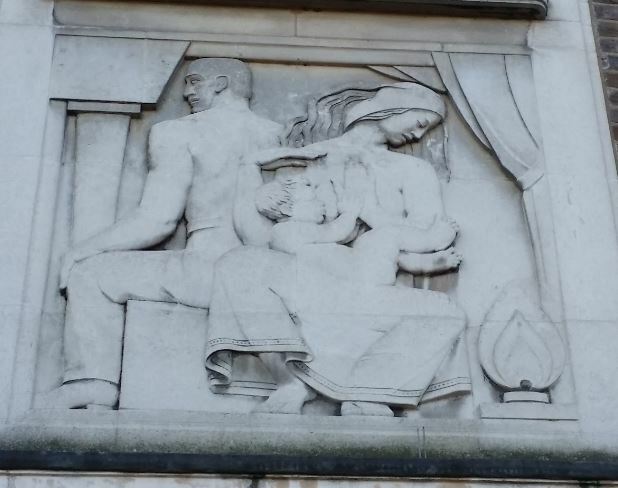 This too would feature an Ayres relief, representing – appropriately enough – the Spirit of Electricity. Both buildings are now in private ownership – the former gas showrooms have become a branch of Barclays, the electricity showrooms an Italian restaurant. But, listed and preserved, the ensemble reminds us of an era in which local government took justifiable pride in its key and progressive role in the life of its community. Wider politics were less propitious and the Town Hall would witness some of the politics of this ‘low dishonest decade’ at first hand. 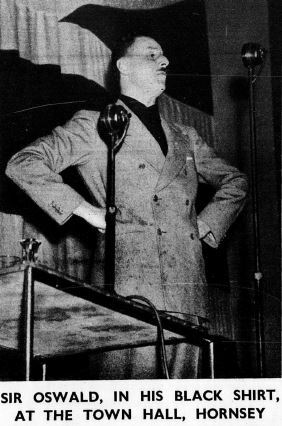 A meeting of the Spanish Medical Aid Committee – to support the democratic Republican forces against the threat of Franco’s Nationalists – was held in the Assembly Hall but another, apparently, was cancelled through fears of public disorder. For many, Hornsey Town Hall is better remembered as being the venue for some of the first performances of Ray Davies (then a student at the Hornsey College of Art, later of the Kinks) and the very first performance, in 1971, of Queen. raced to Hornsey Town Hall to announce the birth of a new society. ‘Paris Today, Hornsey Tomorrow!’ was the slogan we scrawled across the full width of the building’s imposing façade. There was no doubt about it. We would make sure that the good burghers of Hornsey would know the Revolution had begun. But our triumphalism was short-lived. By 10am the next day the forces of reaction in the form of Haringey Borough Council had stepped in and their cleaning department had almost obliterated our handiwork – almost, but not quite. The ghostly outline of that night’s work remained for many years; it certainly outlasted our hoped-for revolution. And thereby hangs another, less revolutionary tale, though one almost as disturbing to some of Hornsey’s ‘good burghers’. In 1965, Hornsey Borough Council was abolished – swallowed up within a new Greater London alongside Tottenham and Wood Green as part of the new London Borough of Haringey. The centre of gravity moved left politically and, administratively, to the east – to the Wood Green Civic Centre which became the headquarters of the new local authority. 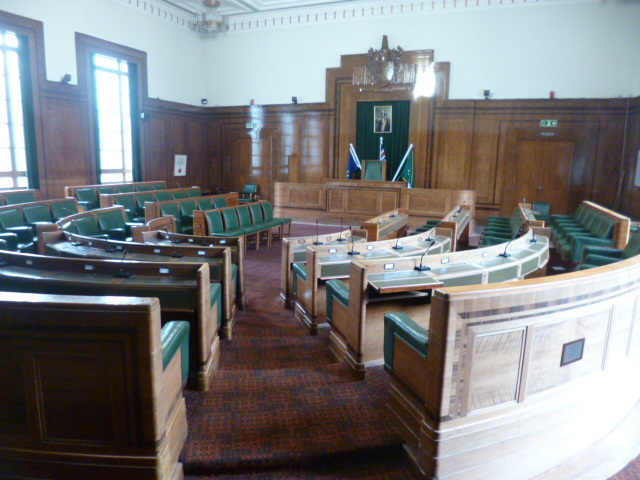 The Town Hall remained home to a few of Haringey’s technical services for some years but the Assembly Hall was closed in 1987 – the Council being unable or unwilling to maintain it – and by 2004 the building as a whole was essentially redundant. But Haringey’s proposal to dispose of the building aroused a storm of protest. To opponents, organised by Crouch End for the People, this was a ‘defining and critical moment…the centrepiece of our “village” could be sold off by the council’. 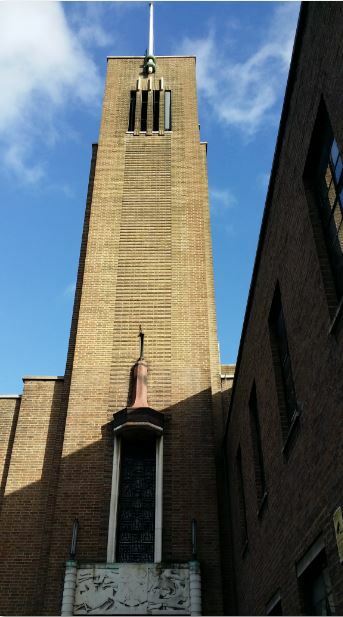 The group set up its own Hornsey Town Hall Trust to promote community use of the building. Having rejected the Trust’s alternative business plan, the Council set up its own Community Partnership Board – distrusted by Crouch End activists as an unrepresentative tool of the Council’s political interests. An independent body, the Hornsey Town Hall Creative Trust, was set up in 2007. In 2008 planning permission and Listed Building Consent was obtained for a scheme to bring the Town Hall back into use with public halls, community rooms, theatre space, cafes and landscaping but the funding depended partly on an adjacent building development. In 2011, these proposals were superseded by a plan by the Mountview Academy of Theatre Arts to transform the Town Hall into – in their words – ‘an arts, culture and education hub for Haringey, wider London and the UK’ but these plans also were withdrawn by early 2015. In the meantime, the Town Hall has enjoyed a half-life as a location for a number of dramas, most notably The Hour (where it stood in the BBC’s Lime Grove studios) and Whitechapel. Currently, a three-man arts collective has a one-year lease on the building, renting space to a range of creative enterprises and providing a programme of arts events whilst shoring up the basic fabric of the building. Consultation continues regarding future uses and a possible partial residential redevelopment which will maintain public areas for community use. I don’t have a dog in the fight and, as a municipal dreamer, I can’t help but regret the loss of the Town Hall complex’s original functions and, more intangibly, the dignity and presence attached to them. If you do visit Crouch End, admire the architecture and recall the civic pride it spoke to. You’ll find some images of the interior in this post to my Tumblr account. (1) Twentieth Century Society, Civic Plunge Revisited, 24 March 2012. The Council guidelines which follow are quoted from the same source. (7) Bryan Fanning and Denis Dillon, Lessons for the Big Society: Planning, Regeneration and the Politics of Community Participation (2012). More information on various proposals can be found in Richard Waite, ‘Bennetts win cash backing for Hornsey town hall overhaul‘, Architects’ Journal, May 31 2012. 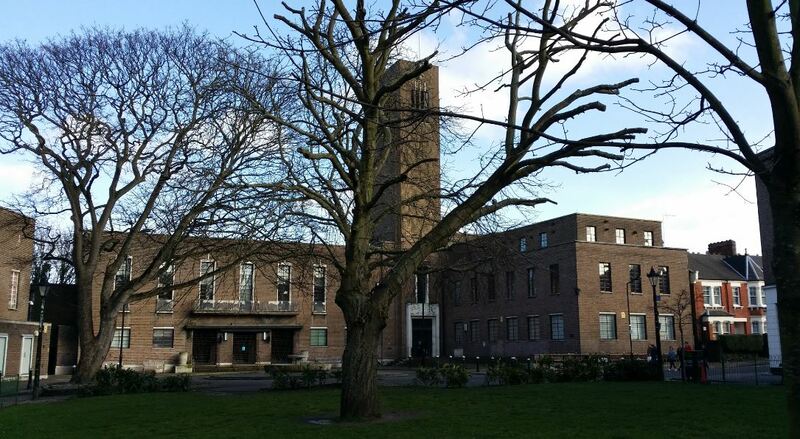 The Hornsey Town Hall Creative Trust website provides ongoing detail of what’s happening with and in the Town Hall, including an events calendar. The fullest treatment of the architecture and history of Hornsey Town Hall is provided by Bridget Cherry, Civic Pride in Hornsey. The Town Hall and its Surrounding Buildings published by the Hornsey Historical Society (2006). This provides the context for my own treatment of the topic. To be honest, it’s not likely that they always did – ‘dignity’ is not a word that readily characterises the storm and stress of some of the borough’s later politics. But the Town Hall itself has stood as a worthy monument to the ideals of local government. Time was when Hackney was a rather genteel village well beyond the grit and grime of the growing city but those days ended with the coming of the railway in 1850. When Mare Street was widened and as the tramways arrived in 1872, Hackney became an industrial and increasingly working-class suburb of London. This was ‘a modern structure…a striking contrast to many of the quaint old buildings which surround it’ but it was, apparently, soon found wanting. (3) And the more so as Hackney Metropolitan Borough Council was established in 1900 and as local government’s functions grew. 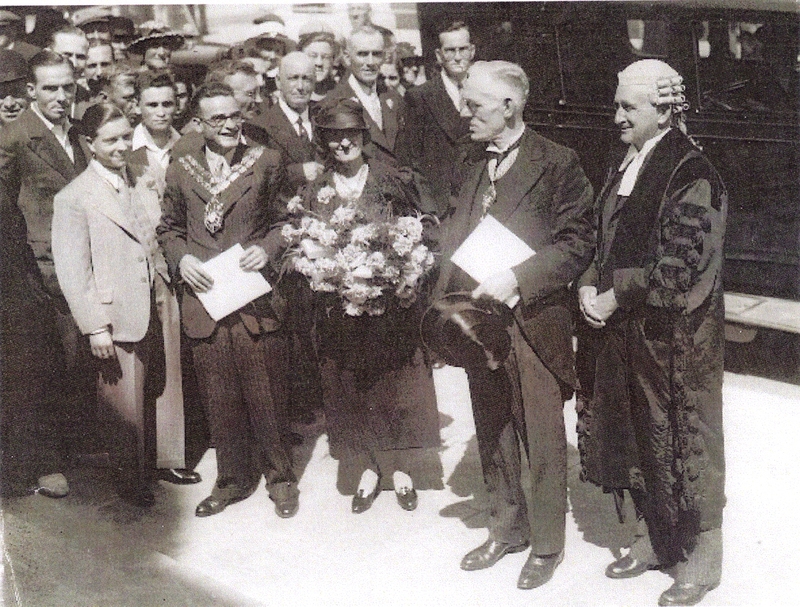 The new Council remained under Conservative control until – in that year of Labour triumph at the height of post-war discontent – Labour took control in 1919. But the Party lost every seat in the succeeding elections of 1922. 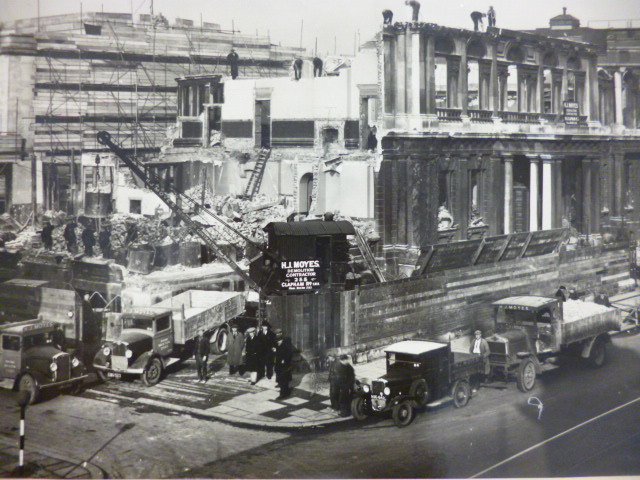 Demolition of the old Town Hall and construction of the new, mid 1930s. Courtesy of Hackney Archives. The old Town Hall was demolished and civic gardens and a war memorial constructed in front of the the new building. That contained, traditionally, a grand entrance hall and staircase leading to that heart of local democracy, the Council Chamber. Ground floor offices contained the sinews of local government – the offices of the Borough Engineer, Medical Officer of Health, Borough Treasurer and the Registrar of Births, Deaths and Marriages. Perhaps more impressive to the ordinary public was the new Assembly Hall built to the rear of the building, capable of seating 600 but with provision to be divided into three sections for a variety of other uses. What remain outstanding are the Art Deco décor and fittings. Now fully restored, it is a beautiful building. And one that did bestow a dignity and grandeur to its civic role. This was certainly the ideal of those city fathers (mainly fathers) who inaugurated the building in 1937. Ironically perhaps, this was now – and would remain – a Labour council. Labour had swept to power in Hackney in 1934. They maintained control until the abolition of the old Metropolitan Borough in 1965 with a near or absolute monopoly of seats for most of the period. 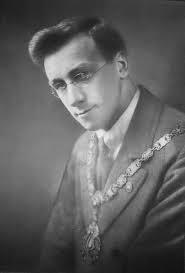 Thus it was that a Labour mayor, Alderman Herbert W Butler, and the then Labour Leader in the House of Lords, Lord Snell – born Harry Snell, the son of agricultural workers – presided over events on that July day. represented something more than mere stone and wood put together; it embodied the ideal of social living which they would have to keep going. It was not the property of the Mayor and the Corporation; it was the property of the people of Hackney. It was for their use and to serve their needs, and what it did would react upon every home in every street in the borough. It was a symbol of their idealism and a focal point for the services of their great borough, and he hoped they would find in it an atmosphere of quiet dignity, purity of administration and of love for the purpose to which it was devoted. At this time, Hackney’s politics might be best personified by Herbert Morrison. 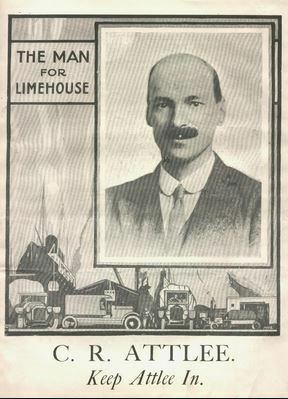 Morrison had been a Labour mayor of Hackney in 1920 in that earlier phase of Labour rule. He was now Labour leader of the London County Council but his brand of Labourism – ethical roots and bureaucratic leanings – lived on. This politics survived and thrived in Hackney after 1945. But, for all its qualities and genuine pedigree, it became in its time a rather ‘Establishment’ politics focused on the bastions of old-style Labour representation – on the council, in the unions and in the tenants’ associations. Meanwhile, Hackney – and the wider world – was changing. By the eighties, the enlarged Borough was one-third ethnic minority (that proportion is now nearer two-thirds). Women were another ‘minority’ who – in this new world – were not a part of old Labour’s ‘natural constituency’. And a new generation of university-educated, Marxist-influenced politicians emerged whose socialism branded old Labour as conservative, even privileged. A New Left politics developed which properly focused on local issues of race and gender and advanced forms of ‘community development’ and decentralisation which challenged the structures of old Labour power. Its representatives took power in Hackney in 1982. The vital question, of course was could they also deliver the bread and butter services vital to all sections of the community and which remained the staple of local government’s role as identified by Harry Snell fifty years earlier. That’s as sympathetic a portrayal of the splits which ravaged Hackney’s local Labour politics in the eighties and nineties as I can come up with and, of course, it’s hugely simplified. Luckily, this isn’t a blog about the intricacies of recent Labour politics. Suffice to say, a more stable, less ideologically-coloured Labour politics grew after 1997. Whether Harry Snell was turning in his grave in the meantime, you can judge. Back to the Town Hall and back to local government and its more traditional functions. The Council’s new Service Centre – designed by Hopkins Architects Partnership, built at a cost of £43,733,000 and winner of a 2011 RIBA Award for architectural excellence – was opened in March 2010. 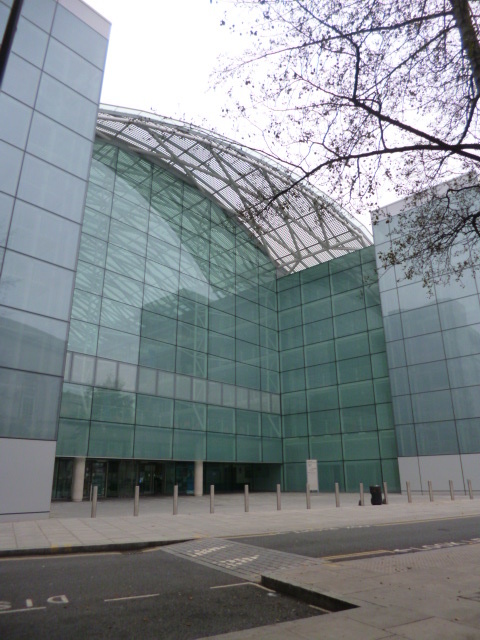 Its 15,000 square metres, arranged over five floors, house the Council’s administrative staff but, more strikingly, it acts – in the massive atrium containing the Council’s one-stop shop and public reception – as an innovative ‘focal point for the services’ of the Borough that Harry Snell might be proud of. (4) Elizabeth Robinson, Twentieth Century Buildings in Hackney, Hackney Society, 1999. Full architectural details of the Grade II listed building are provided in the English Heritage listing. Especial thanks to the helpful staff of Hackney Archives for access to primary sources mentioned above and for permission to use the images noted above. All reasonable efforts have been made to ascertain the copyright situation with these photographs and documents, but please contact Hackney Archives with any queries or further information.